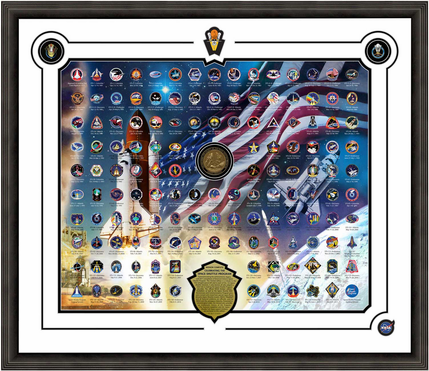 Features all 135 official Space Shuttle mission pins plus three other commemoratives minted from metal flown abord a Space Shuttle mission. Limited to 3,500 sets. Solid brass plate tells the edition's story and is engraved with each individual frame's limited edition number. Certificate of authenticity is included. 28.5" x 32.75"